When I predicted a week ago that Diane Von Furstenberg’s first box clutch wouldn’t be her last, I couldn’t have guessed how quickly she would prove me right. 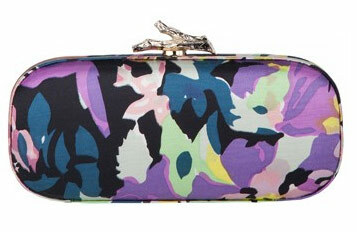 Soon thereafter, DVF’s Resort 2011 collection surfaced with two clutches that used the exact same clasp hardware as the twig-topped Fall/Winter 2010 clutch. 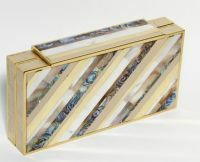 When we talked about the Louis Vuitton and Lanvin striped mother of pearl clutches last week, I still partly believed that the similarities of the two evening bags were a coincidence – after all, two bags does not a trend make. Three bags do, however, and that’s exactly what this Judith Leiber Resort 2011 is: a sign of a burgeoning trend.